It’s a very good collection. There’s nothing very showy here, but everything is so very well observed – as one might expect from a writer with an interest in journalism! Ah, I see. Well, this would definitely be a good one for you. While we’re on that subject, have you read Nigel Balchin’s Darkness Falls from the Air? It has one the most atmospheric evocations of the Blitz I’ve read. It’s also an excellent book – a little like Graham Greene’s The End of the Affair, but without the overwhelming weight of all that Catholic guilt. LOL I don’t mind Catholic guilt:) I think that maybe the world might be a better place if people felt guilty about the awful things they do. These days there’s always an excuse and very little contrition. I’ll look out for Darkness Falls From the Air, thanks. Ha – good point! I think you’d like the Balchin – it’s well worth seeking out. Lovely review, Jacqui. I’ve not read anything by Painter-Davies but the quotes you’ve pulled out are so good I think I should rectify that. I particularly liked ‘she had imagined a medium dinginess that would wear off with one or two good scrubbings and a generous handout of gingham pinafores’. Perfect! She’s a very good writer, criminally underappreciated given her legacy with The New Yorker. (I think she was their London correspondent for somewhere in the region of 50 years.) Either this collection or One Fine Day would be a good place to start. In fact, there isn’t a lot available, so it’s relatively easy to choose! I’m glad you liked the line about the Clark children. It’s an interesting little story, one that exposes some of the less than desirable attitudes that were prevalent among certain classes at the time. You really get a sense of how difficult it must have been for various families during those years of upheaval and uncertainty. I’m sure that many of them were made to feel their place, so to speak. Great review Jacqui. I loved One Fine Day – such an atmospheric book – and I have her other Persephones lined up on the shelf. A wonderful author! I think you’ll like these stories, Karen. While they don’t quite have the stylistic flourish of One Fine Day, they are beautifully observed. Something to look forward to for sure. What a wonderful review! I’ve read and loved One Fine Day as well as her short stories and Letter from England, a compilation of her New Yorker pieces. Thank you for spreading the word about this fine writer. Oh, you’re very welcome. I’m glad you enjoyed my review – that’s good to hear. 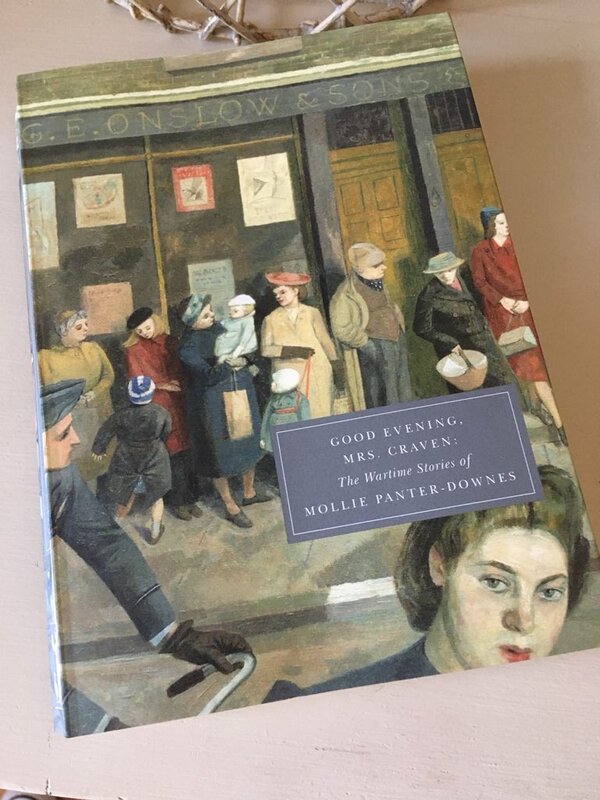 I particularly wanted to write about Mollie P-D because I don’t think she gets the level of attention she truly deserves, especially compared to other English writers from the same era. Her profile doesn’t seem to be as high as say Elizabeth Taylor’s or Olivia Manning’s, and yet she was operating in a similar space. I’d like to read her London War Notes at some point…we’ll see. I can’t wait to read this as well as London War Notes. Glad to hear you enjoyed these stories so much. I bought this after reading One Fine Day which I thought was magnificent. Yes, I loved One Fine Day as well. A beautiful combination of style and substance. The way M P-D used Laura’s community to build up a broader picture of a nation adjusting to change was so skilfully done. Like you I was keen to read more of her work after One Fine Day – hence the purchase of this one. I’m trying this AND one fine day! This is such a lovely collection, MPD portrays ordinary people at this time to perfection. I loved both this collection and the peace time stories. I read One Fine Day too which is exquisite. I still have the London War Diaries to read. I agree. I think she captures these largely domestic canvases so well. Her writing demonstrates a clear understanding of the tensions that can arise between individuals who find themselves thrown together at a time of great change and uncertainty. I couldn’t help but think of some of Elizabeth Taylor’s work as I was reading these stories. There are some similarities between the two, I think. Wonderful review, Jacqui. I love One Fine Day as well and am pretty certain I like thus as well. The quotes you shared are great. I particularly liked the one about the Parmenter. The sense of humor is wonderful. I think you’d love these stories, Caroline. They feel so brilliantly observed and true to life; it’s almost as though you’re a fly on the wall just watching everything unfold. There’s a real sense of poignancy and absence in some of the pieces, and yet the dry humour also comes through to add a lighter touch from time to time. That story featuring Mr Parmenter is very amusing! Sharp perceptions of class differences. I like that. Always makes English writing interesting. Yes, she’s good on that. It’s also done in such a way that the reader can come to their own conclusions about the situation. I don’t think she takes sides if you know what I mean. Must find this and One Fine Day! Great reviews! Thank you! She is definitely worth seeking out. I do hope you enjoy her. One Fine Day works wonderfully as a bookend to the War along with Woolf’s Between the Acts as a Preface. That’s a really interesting observation. I’ll take a look at Between the Acts, not a Woolf I’ve come across before. Thank you for mentioning it.